Chief town of Warwickshire. The Jewish community consists (1902) of a population of about 4,000, having grown to this number from 140 families (700 souls) in 1851. The first Jewish settlement is believed to have taken place about the year 1700; but the earliest records of the community are lost. 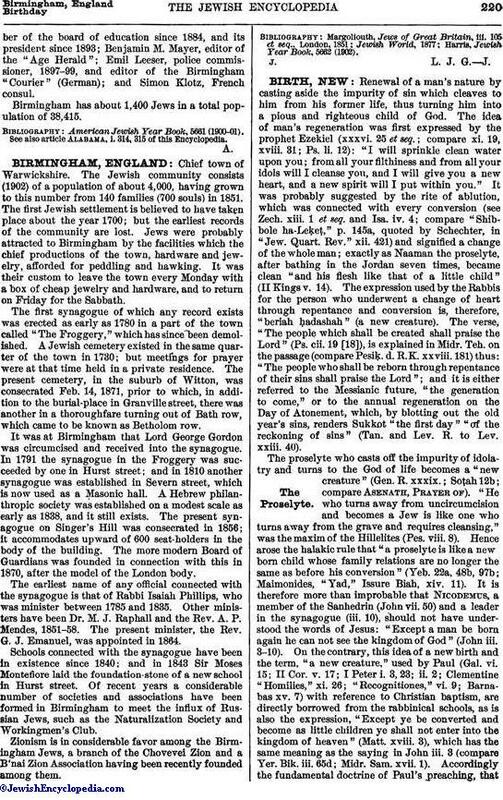 Jews were probably attracted to Birmingham by the facilities which the chief productions of the town, hardware and jewelry, afforded for peddling and hawking. It was their custom to leave the town every Monday with a box of cheap jewelry and hardware, and to return on Friday for the Sabbath. The first synagogue of which any record exists was erected as early as 1780 in a part of the town called "The Froggery," which has since been demolished. A Jewish cemetery existed in the same quarter of the town in 1730; but meetings for prayer were at that time held in a private residence. The present cemetery, in the suburb of Witton, was consecrated Feb. 14, 1871, prior to which, in addition to the burial-place in Granville street, there was another in a thoroughfare turning out of Bath row, which came to be known as Betholom row. It was at Birmingham that Lord George Gordon was circumcised and received into the synagogue. In 1791 the synagogue in the Froggery was succeeded by one in Hurst street; and in 1810 another synagogue was established in Severn street, which is now used as a Masonic hall. A Hebrew philanthropic society was established on a modest scale as early as 1838, and it still exists. The present synagogue on Singer's Hill was consecrated in 1856; it accommodates upward of 600 seat-holders in the body of the building. The more modern Board of Guardians was founded in connection with this in 1870, after the model of the London body. The earliest name of any official connected with the synagogue is that of Rabbi Isaiah Phillips, who was minister between 1785 and 1835. Other ministers have been Dr. M. J. Raphall and the Rev. A. P. Mendes, 1851-58. The present minister, the Rev. G. J. Emanuel, was appointed in 1864. Schools connected with the synagogue have been in existence since 1840; and in 1843 Sir Moses Montefiore laid the foundation-stone of a new school in Hurst street. Of recent years a considerable number of societies and associations have been formed in Birmingham to meet the influx of Russian Jews, such as the Naturalization Society and Workingmen's Club. Zionism is in considerable favor among the Birmingham Jews, a branch of the Chovevei Zion and a B'nai Zion Association having been recently founded among them. Harris, Jewish Year Book, 5662 (1902). J. L. J. G. J.